Europe was originally sandwiched between several future continents. It was ripped off of Africa when North America and Greenland pulled away. Then the block struck Asia, and all of Asia and Europe pivoted on Iran. As Europe was driven back into the Mediterranean, compression raised mountains along Southern Europe and North Africa, while friction formed mountains in Scandinavia. The final stop built the Ural Mountains. For the Plate Tectonics version of the overall tectonics of Europe in the breakup of Pangaea, here are excerpts from the paper (available on the web) The Geological and Tectonic Framework of Europe, by J.A. Plant, A. Whittaker, A. Demetriades, B. De Vivo, and J. Lexa, in Geochemical Atlas of Europe. Part 1 - Background Information, Methodology, and Maps, Salminen R. (Chief-editor), 2005. "During the Jurassic period, the break up of the supercontinent of Pangaea began along the central Atlantic axis. Middle and Late Jurassic opening of new oceanic basins also occurred in the Mediterranean area. The middle and late Jurassic evolution of western and central Europe was dominated by crustal extension across the north Atlantic rift system. The early Cretaceous development of Europe continued to be dominated by crustal extension." 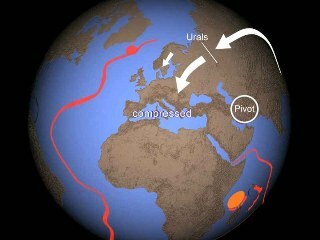 Next occurred the continental collision of Europe and Africa. "Data from the Alps indicate that there were at least two distinct major episodes of tectonic activity, one during the Cretaceous and a later one in the Tertiary. This second, and later phase of Tertiary convergence, resulted from N-S to NNE-SSW directed plate motions between Europe and Africa in the Eocene, and NW-SE directed motions in the Miocene." "The late stages of the collision, produced spectacular large-scale backfolds in the Penninic nappes of the central Alps, movements related to a wedge of Adriatic crust, which was forced into the European crust. South Alpine thrusting occurred during Palaeogene, Miocene, and Plio-Pleistocene events, and shortening of the entire south Alpine fold- and thrust belt is of the order of 70-115 km. 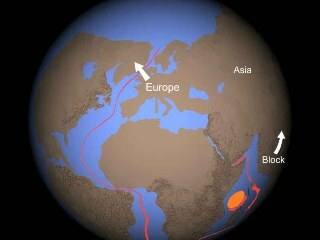 The latest movements of the collision reflect the north-westwards motion of the African plate relative to Europe." 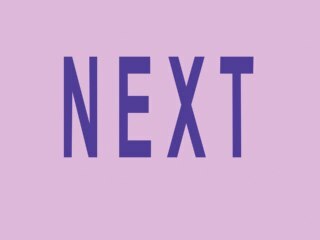 "During the Neogene and Quaternary, the convergence direction between Eurasia and Africa-Arabia gradually changed, and was dominated by dextral translations." The convergence and mountain building portion of the Plate Tectonics scenario gets somewhat complicated. In addition to the Eurasian and African plates, parts of the Mediterranean, southern Europe, and Turkey are divided into "microplates", whose numbers, boundaries and rotations are still debated. At right, the toothed black line traces the convergent plate boundaries where one plate is supposed to ride over another (the side with the tooth is the overriding plate). The numbered boxes point to various "arcs". This intricate puzzle is forced upon Plate Tectonics because it requires plate collision to build mountains. In Shock Dynamics, continental crust slides upon oceanic crust, allowing greater flexibility. Aside from the vast differences in duration, there are general similarities between the Plate Tectonics and Shock Dynamics sequences of events. Rifting of the Atlantic pulled the crust (extension) and opened basins, followed by compression that raised mountains in southern Europe. 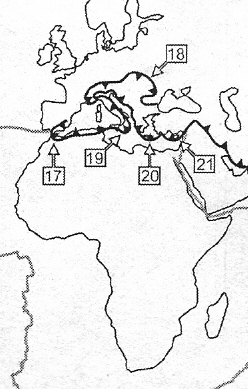 However, the movement of Africa north, northeast, and northwest caused the compression in the Plate Tectonics version, while in Shock Dynamics Africa is stationary and Europe is pushed down instead. 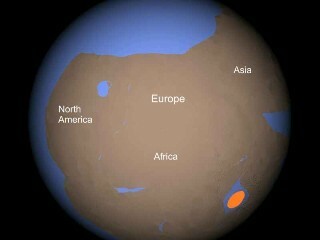 As usual, Plate Tectonics gives no particular reason for when or why Africa moved north. Looking at the map below, you can see the mountains raised by compression. The Shock Dynamics scenario is much simpler and provides the torque that is apparent in the curved mountain chains.